Children can be either very cruel or very kind to a child who is different. They may be cruel by teasing, laughing, imitating, or even doing physical harm. But more often they are cruel simply by not including the disabled child in their games or activities, by rejecting the child, or by pretending she does not exist. Often children act in a cruel way because they fear what they do not understand. When they gain a little more understanding, children who may have been cruel or felt uncomfortable with the child who is different, can become that child's best friends and helpers. It is important that children in every neighborhood or community have a chance to better understand persons who, for whatever reason, are different from themselves - in color, in dress, in beliefs, in language, in movements, or in abilities. One way to help a group of children gain appreciation of the disabled child and learn ways to be helpful is through CHILD-to-child activities. CHILD-to-child is a non-formal educational program in which school-aged children learn ways to protect the health and well-being of other children -especially younger children and those with special needs. The children learn simple preventive and curative measures appropriate to their own communities. They pass on what they learn to other children and their families. The CHILD-to-child program began during the International Year of the Child, 1979. David Morley (author of Paediatric Priorities in the Developing World and See How They Grow) brought together a group of health workers and educators from many countries. They designed a series of 'activity sheets'-or guidelines-to be adapted by teachers and health workers for children in different countries and situations. How do we know if our children get enough food? by parent groups or any concerned persons in the community. become the friends and defenders of any child who is different or has special needs. Make sure that their younger brothers and sisters do not go too close to the cooking fire. Be sure that handles of pans are turned so that the child does not pull them. Warn younger children about where snakes, scorpions, and bees live. Clear grass and weeds away from paths. Make sure poisons such as medicines and insecticides are kept out of reach, and that kerosene is not stored in drink bottles. Do you know any child who cannot walk or run or talk or play like other children? Why can't this child do everything the same as you can? Is the child to blame? How do other children treat this child? Are they kind to him? Are they mean? Do they make fun of him? Do they include him in their games? How would you feel if you had a similar problem? How would you want other children to treat you? Would you like them to laugh at you? To pay no attention to you? To feel sorry for you? To do things with you and become your friend? Children will better understand the child with a special problem if they can 'put themselves in his shoes'. They can play a game in which one child pretends to have a handicap. For example, tie a stick to a child's leg. Then have him run in a game or play tag. The other children act out different ways of behaving toward the child. Some are friendly. Some ignore him. Some make fun of him. Some help him. Some include him in their games. Let the children think up their own ideas and act them out. After several minutes, another child can pretend to have a handicap. Let several children have a turn with a handicap. Try to make the pretend handicap seem real. For a more severe physical disability, the group of children can invent ways to 'find out what it is like'. For example, to learn about a child with almost no use of her legs, the children might tie the legs of one of their group together, like this. 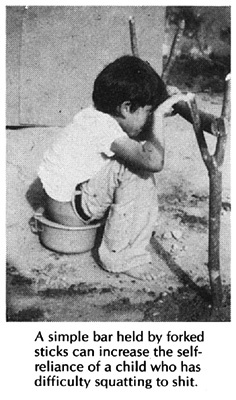 Then the children can ask the child to do some of their day-to-day activities- like moving around the house, going to the latrine, and going to school. After talking with the child about her difficulties, the children can try to think of ways to make it easier for her to move about. Note: With the help of their teacher or parents, children can, in fact, make simple wheelchairs and other aids for disabled children. For simple designs, see PART 3 of this book. REMEMBER: Children are usually kind to a child with a very severe disability. They are often more cruel to a child with a less severe problem, such as a limp. Help the children gain an understanding of the particular difficulties of any disabled child in their village. For example, if there is a child with spastic legs who has trouble walking because his knees press together, have a child try to walk with her knees tied together with a band of car tire inner tube. To appreciate the problems of a child who has trouble with balance (cerebral palsy), have one of the children try to walk on a hanging board (or other moving surface). 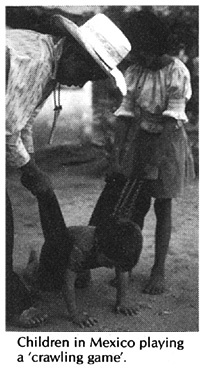 If there is a child with arthritis in the village, some of the children can put small stones in their shoes or tie small stones to the bottoms of their feet. Then the other children can invite them to run and play games. Ask the children why a child with arthritis might not want to play games. Ask the children, "Do you know any children who cannot use their hands like you can?" If they answer yes, help them experience the difficulties of such a child. Have the children work in pairs. One child can wrap a strip of cloth around the other child's hand and fingers so that he has trouble moving his fingers. Have the children try to figure out ways to make it easier. For example, wrap cloth or a piece of inner tube around a pencil or spoon, to make it easier to hold. See Pages 223 and 330. A disabled child cannot do everything as well as other children. But often there are some things she can do as well, or even better. Try to have the children think of examples. A child with weak legs, who has to walk with crutches, often develops very strong arms and hands. Or a blind child may learn to hear things extra well. Rather than feel sorry for the disabled child and look only at her weaknesses, it is better to recognize and encourage her strengths. A handicapped child needs friends, and excitement - just like you. Try to include the child in your games and adventures. Let him do as much for himself as he can. and help him only when he needs it. But remember, he cannot do everything you can. Protect him from danger. . . but do not protect him too much! Too much protection is dangerous to any child's health. Children need adventure for their minds to grow, just as they need food for their bodies to grow. A friendly word of welcome to include the child with a special problem, or a little extra time or attention given to him, can make a big difference-and can make everyone feel good. To help see how much it matters to include a disabled child in their fun, a group of children can act out different possibilities. For example, they might act out (or do a 'role play' of) the pictures at the bottom of the page before this one. After the role play the group can discuss which of the two alternatives made the disabled child, and the other children, feel better, and why. Or they can act out a situation in which they try to solve a particular difficulty, obstacle, or challenge. For example, there is a bright little girl who has no control of her arms or hands, but fairly good movement of her head and one foot. Can the children figure out a way to help her write? The class divides into 3 or 4 groups to try to solve the problem. In these ways the children will begin to use their imaginations to help solve problems. If some of the children's role plays turn out especially well, or do an extra good job at demonstrating important points, perhaps they can be developed further. Then the children can present them, in the form of skits or children's theater, to other classes, parent groups, in the health center, or perhaps to the whole village. Once the children have developed a greater awareness of the needs and possibilities of disabled children through discussion, games, role plays, and stories, they can begin to put their new understanding into practice. Ask the children if they know any child in the village (or in a neighboring village) who is disabled or has special difficulties in any way. Then discuss ways that the children might be able to help each disabled child become as happy, capable, and self-reliant as possible. The children can list their suggestions for each child. Later, after getting to know the child and her family better, they can change and add to their ideas. If the disabled child is a brother or sister of one of the children in the learning group, starting to do things with the child and the family may be fairly easy. But if none of the children is related to the disabled child, they must be careful in the way they offer their help. Probably only two or three children should make the first visit, perhaps with the help of a teacher, health worker, or rehabilitation worker. Become friends-one or more children can become close companions, playmates, and friends of the disabled child. Visit the child at home- regularly! Help the family by doing errands, 'babysitting' or taking the child on outings. Figure out a way to help the child get to and from school. At school, one or more children can become the 'buddies' or helpers of the disabled child, making sure her special needs are met. If it is impossible for the disabled child to go to school, children may be able to organize an after-school teaching program at the child's home. Ask the teacher to help plan this. Figure out ways to include the child in games. Make a 'rehabilitation playground' or 'playground for all children'. Take disabled children regularly to the playground and play together with them there. Build simple playground equipment, adapted for the particular child, at her home. With advice from a rehabilitation worker or the child's parents, learn to help with the exercises or care that the child needs. You may be able to help build special aids for the children, such as crutches, sandbags, braces, or even a simple wheelchair. Try to get advice from a rehabilitation worker. If what you need to make is too difficult, perhaps the children can ask parents who are craftspersons to help. Visit them as a committee. Become 'prevention scouts' by following the suggestions on Page 428, or by taking other actions to prevent disability in your village. If there is a village rehabilitation center in your village, perhaps a group of children can take turns there as volunteers after school. There are many ways you can help and much you can learn. Those who show most interest can become 'junior rehabilitation workers'. Some children are very disabled. They cannot walk or swim or play many games, But sometimes these children can learn to play marbles, cards, or guessing games. Learning is especially difficult for a child who cannot speak or think as easily as other children. This child may be very lonely. Sometimes a child who cannot speak, understands a lot more than people think he does. If there is such a child in your neighborhood, perhaps children could take turns visiting him, to talk or play with him. Let him know you care. Sometimes a baby is slower than most to develop. Either her mind may be slow to develop, or her body, or sometimes both. The child will be later than other babies in the village to begin to sit, use her hands, crawl, walk or talk. Babies who are slow to develop need special care. If possible, their parents should get advice from a rehabilitation worker or physiotherapist. However, there is a lot that brothers and sisters and other children can do. More than almost anything else, these babies need lots of attention. They need to be played with and helped or encouraged to play. They need simple toys and colorful or noisy things to attract their attention. They need to be talked to and sung to a lot. These things will help the baby develop faster. And these are all things other children can do. In the next activity sheet (Page 442) we will talk more about helping a child whose mind develops slowly or who has difficulty understanding. Make it fun! If exercises can be turned into games, the child will learn faster and everyone will enjoy it more. Self-help. Help the disabled child only as much as he needs. Encourage him to do as much as he can for himself and by himself. Little by little. Remember, some things are especially difficult for the disabled child. Encourage her to do a little more than she already does-and then a little more. If you have her try to do too much, she may get discouraged and stop trying. Show you care. Show the child how glad you are when he learns to do new things. Praise him when he does well-and when he tries. Mind and body. Play often with the child, in ways that help her develop not only her body but also her mind. Talk with her and tell her stories. Become her friend. AN EXAMPLE: Pablo is having trouble learning to crawl. Using the above suggestions, how can we help him? Perhaps his older brothers and sisters, or other children, can play 'crawling games' with him. Two children can hold up part of his weight as he tries to crawl. Another child encourages him to crawl by holding out a fruit or toy. Call him to crawl toward the fruit. Praise him when he tries. Play the game every day. As Pablo grows stronger, less of his weight will need to be held up. In time he may be able to crawl without help. Note:Many more ideas of ways children can help a child who is slow to develop can be found in PART 1 of this book, especially Chapters 34 and 35. Story telling is another good way to help young people understand the needs and possibilities of disabled children and what can be done to help. You can make up stories. Or better, you can base them on true events where a disabled child has achieved something outstanding, or where a group of children have succeeded in making an important difference in the life of a disabled child. The story that follows is an example. "Understanding Children with Special Problems"
At age 7 Julia's world was so small that you could throw a stone clear across it. She had seen almost nothing of her own village. No one ever took her anywhere. The farthest she had ever crawled was to the bushes just outside the small hut where she lived with her family. Julia was the oldest of 3 children. Her family's hut was at the far edge of Bella Village. The hut was separated from the main footpath by a long, steep, rocky trail. Perhaps for this reason, Julia had missed being vaccinated in her first year of life, when health workers had come to the village. In the beginning, Julia had been a healthy baby, and quick. At 10 months of age she was already able to stand alone for a few seconds, and to say a few words, like 'mama', 'papa', and 'wawa'-which meant water. Her face would light up in a big smile whenever anyone called her name. Her parents took great pride in her, and spoiled her terribly. But at 10 months Julia got sick. It began like a bad cold, with fever and diarrhea. Julia's mother took her to a doctor in a neighboring town. The doctor gave her an injection in her left backside. A few days later Julia got worse. First her left leg began to hurt her, then her back, and finally both arms and legs. Soon her whole body became very weak. She could not move her left leg at all and the other leg only a little. In a few days the fever and pain went away, but the weakness stayed, especially in her legs. The doctor in town said it was polio, and that her legs would be weak all her life. Julia's mother and father were very sad. In those days there was no rehabilitation worker in the village or in the neighboring towns. So Julia's mother and father took care of her as best they could. In time, Julia learned to crawl. But she did not learn to dress or do much for herself. Her parents felt sorry for her, so they did everything for her. She gave them a lot of work. Then, when Julia was 3 years old, a baby brother was born. This meant her parents had less time for Julia. Her little brother was a strong, happy baby, and her parents seemed to put all their hopes into the new child. They paid less attention to Julia, rarely played with her, and never took her out with them into the village. Julia had no friends or playmates - except for her baby brother. Yet sometimes, for no clear reason, Julia would pinch her baby brother and make him cry. Because of this, her parents did not let Julia hold or play with him often. Julia became more and more quiet and unhappy. Remembering how quick and friendly she had been as a baby, her parents sometimes wondered if her mind, too, had been damaged by her illness. Although the doctor had explained that polio weakens only muscles, and never affects a child's mind, they still had their doubts. When Julia was 6 years old, a third child was born a baby sister. This seemed to make Julia even more unhappy. She spent most of her time sitting outside behind the hut drawing pictures in the dirt with a broken stick. She drew chickens, donkeys, trees, and flowers. She drew houses, people, waterjugs, and devils with horns and long tails. Actually, she drew remarkably well for a child her age. But no one noticed her drawings. Her mother was busier than ever with the new baby. Julia was 7 years old when the village school teachers, guided by a health worker from a nearby village, began a CHILD-to-child program in the school. The first and second year children (who were in the same class) studied an activity sheet called "Understanding children with special problems." Most of the children knew of only one seriously disabled child in their village. This was Tomás. Tomás walked in a jerky way, with crutches. He had one hand that sometimes made strange movements. And he had difficulty speaking clearly, especially when he was excited. But Tomás did not seem to need any special help-or at least not anymore. He was already in the fourth grade of school and doing well. He had lots of friends. He managed to go anywhere and do almost anything for himself, if awkwardly, and nearly everyone treated him with respect. It was easy to forget he was disabled. Then one little boy remembered, "There's a girl who lives in a house at the far end of the village. She crawls around on her hands and knees, and spends a lot of time just sitting outside. She always looks sad. I don't know her name, but she looks old enough to be in school"
"Let's invite her to come to school with us,'' said one of the children. "But how." asked another, "if she can't walk?" "We could bring her in a push cart!" "No! The path from her home is too steep and rocky." ''Then we'll carry her! If we all help, it will be easy." "Let's go to her house this afternoon." "Good idea!" That afternoon after school, 6 of the school children, together with their teacher, visited Julia's home. Julia, who was out back, was too shy to come in. So they started talking with her mother. "We want to be her friends," they said. "And to help her go to school." "But she can't go to school," her mother said with surprise. "She can't even walk!" "We can carry her," offered the children. ''We'll come for her every day and bring her back in the afternoons. It's not far, really!" "The whole class is ready to help out," said the teacher. "And so am I." "But you don't understand," said her mother. "Julia's not like other children. They'll tease her. She is so shy she doesn't open her mouth around strangers. And besides, I don't see how school could help her." The teacher tried his best to explain to the mother the great importance of school for a child like Julia. The children promised that they would all be friendly and help her in any way they could. But her mother just shook her head. ''Do you think Julia would like to go to school?'' asked the teacher. Her mother gave a tired sigh. Then she turned to Julia, who was hiding outside the door but peeping in at the visitors. "Julia, darling, do you want to go to school?" Julia's eyes opened wide with fear. She shook her head in a terrified NO and disappeared behind the doorway. "There, you see!" said Julia's mother. "For Julia, school just wouldn't make sense.... Now I have a lot of work to do, please excuse me. But thank you for thinking of my poor little girl." ''Please give it more thought,'' said the teacher as he and the children went out the door, "And thank you for your time." "Have a nice day,'' said Julia's mother, and went back to work. At school the next day the teacher met with the whole class to discuss their visit to Julia's home. "This CHILD-to-child stuff sounds so easy and fun when we pretend," said one of the children. ''But when we try to use it in real life, it ain't so easy." "Still," said one little girl who had visited Julia's home, ''we have to keep trying. Did you see the way Julia looked at us? She was so scared she was shaking. But she was interested, too. I could tell. She looked so. . . lonely!" "But what can we do? I don't think her mother wants us to come back"
There was a long silence. Then one little boy said, "I've got an idea! Let's talk to Tomás. He's handicapped, too. But he's in school and is doing fine. Maybe he can help us." After school, several of the first and second year students waited for Tomás, who was in the fourth year. They told him about Julia, and what happened when they visited her home. How was it when you began school, Tomás?" asked the children. ''Were you afraid? Did your parents want you to go? How did the other children treat you?" Tomás laughed. "One question at a time!" He spoke slowly, with a twisted mouth and a sort of jerky speech that sometimes made him hard to understand. "Help me sit down under that tree.'' Tomás moved forward on his crutches. The children helped him sit down. (He explained that his hips and legs wanted to stay straight when he wanted to bend them.) He sat leaning against the tree, and began to answer the children's questions. "Sure, I was afraid to go to school, at first," said Tomás. "And my mom and dad didn't want to send me. They were afraid kids would tease me or that it would be too hard for me. It was grandma who talked us all into it. She said if I couldn't earn my living behind a plow, I'd better learn to earn it using my head. And I intend to." ''What do you want to be when you grow up?" asked one boy. ''Maybe a health worker," said Tomás. "I want to help other people." "Did other kids tease you when you started school?'' asked the children. Tomas frowned. "No ... not much. But they didn't know what to do with me, so usually they didn't do anything. They would stare when they thought I wasn't looking. And they would imitate the way I talk when they thought I wasn't listening. But when they thought I was looking and listening, they would pretend I wasn't there. That's what was hardest for me. They never asked me what I thought, or what I could do, or if I wanted to play with them. I felt lonelier when I was with the other children than when I was by myself." "But now you have lots of friends. You seem like one of the gang. What happened?" "I don't know," answered Tomás. "The other kids just got used to me, I guess. They began to see that even though I walk and talk funny, I'm not really all that different from them. I think it helps that I do well in school. I like to read. I read everything I can find. Sometimes when kids in my class have trouble reading or understanding something, I help them. I like to do that. At first they gave me the nickname 'Crabfoot' because of how I walk. But now they call me 'Professor' because I help them with their lessons." ''The first nickname was about what's wrong with you," observed one little girl. "And the second is about what's right. I guess you showed them what's most important!" Tomás' mouth twisted into a smile and his legs jerked with pleasure. "Tell me more about Julia,' he said. They told him all they could, and finished by saying, ''We tried as hard as we could, but Julia's mother doesn't want her in school and Julia doesn't want to go either. We don't know what to do. Do you have any ideas, Tomás?" "Maybe if I visit the family-with my parents. They can try to convince her parents, and I'll try to make friends with Julia." The next Sunday, when Tomás' father was not working in the fields, Tomás asked his parents to go with him to Julia's home. They arrived in the early afternoon. Julia's mother and father, together with the 2 younger children, were all sitting in the shade in front of the hut. Julia's father was sharpening an ax while her mother picked lice from the children's hair. They all looked up in surprise to see the boy on crutches approaching, followed by 2 adults. The path near the hut was steep and rocky. A few meters from the hut, Tomás tripped and fell. Julia's father ran forward to help. "Are you hurt?" asked Julia's father, helping him up. "Oh no," laughed Tomás. "I'm used to falling. I've learned to do it without hurting myself.... We've come to talk to you about Julia. These are my parents." While Tomás' parents were talking with Julia's, Tomás asked if he could speak with Julia. "She's outside," nodded her mother, pointing to the back doorway. "But she doesn't speak to strangers. She's too afraid." "She doesn't have to speak if she doesn't want to," said Tomás gently, yet loudly enough so that Julia could hear, if she was listening. Tomás went out and found Julia bent over a drawing in the dirt. She glanced up at him as he approached, and then looked down at her drawing, but without continuing it. There were several drawings on the ground of different animals, flowers, people, and monsters. Julia had just been drawing a tree with a big nest in it and some birds. "Did you draw all these?" asked Tomás. Julia did not answer. Her small body was trembling. "You draw very well!" said Tomás, admiring and commenting on each of her drawings. "And with just a stick. Have you ever tried drawing with pencil and paper?" No answer. Tomás continued. "I bet that nobody in school can draw this well!" Julia, still staring at the dirt, trembled and said nothing. Tomás also was silent for a moment. Then he said, "I wish I could draw like you do. Who taught you?" Julia slowly lifted her head up and looked at Tomás, or at least at his lower half. She looked first at his turned-in feet and the tips of his crutches. Then she looked at his knees, which had dark calluses on their inner sides where they rubbed together when he walked. "Why do you walk with those sticks?" she asked. "It's the only way I can," he said. "My legs don't like to do what I tell them." Julia lifted her head and looked up into Tomás' face. Tomás tried to smile, but knew his mouth was twisting strangely to one side. "And why do you talk funny?" asked Julia. "Because my mouth and lips don't always do what I want either," said Tomás. And it seemed he had even more trouble speaking clearly than usual. Julia stared at him. "Do you really like my drawing?" "I do," said Tomás, glad to change the subject. "You have a real gift. Real talent. You should study art. I'll bet some day you could be a great artist." "No," said Julia, shaking her head. "I'll never be anything. I can't even walk. Look!" She pointed to her small floppy legs. ''They're even worse than yours!" "But you draw with your hands, not your feet!" exclaimed Tomás. Julia laughed. ''You're funny!" she said. "What's your name?" "Mine's Julia. Do you really think I could be an artist?-No, you're only joking. I'll never be anything. Everybody knows that!" "But I'm not joking, Julia," said Tomás. "I read in a magazine about an artist who paints birds. People come from all over the world to buy his pictures. And you know something, Julia, his arms and legs are completely paralyzed. He paints holding the brush in his mouth!" "How does he get around?" asked Julia. "I don't know," said Tomás. ''People help him, I guess. But he does get around. The magazine said he has been to several countries." Julia said, "Wow! Do you really think I could become an artist?" Tomás looked again at the drawings in the dirt-and truly wished he could draw as well. "I know you could!'' he answered. "How do I start?'' asked Julia, sitting up eagerly. "First," said Tomás, "you should probably go to school." "But how?" said Julia, looking at her legs. "That's easy," said Tomás. "All the school children want to help. But you have to want to go." "I ... I'm afraid . . " said Julia. ''Do you go to school, Tomás?" "Yes, of course,'' he answered. Inside the house, Tomás' parents were trying to convince Julia's parents of the importance of sending her to school. They explained how they had had the same doubts about Tomás, and how much school had helped him. "It's not only what he is learning that's important," said Tomás' mother, "but what it has done for him personally. He has more confidence -a whole new view of himself." "And we've come to look at him differently, too,'' said Tomás' father. "He's a good student-one of the leaders in his class!" Julia's father coughed. ''Even if all you say is true, Julia doesn't want to go. She's afraid. You see, the same illness affected her. . "
His sentence was cut off by Julia, who came bursting in the back doorway on hands and knees. "Mama! Papa!" she shouted. "Can I go to school? Will you let me? Pleeeease?" Her father's mouth fell open for a moment, And then he smiled. The next day Julia began school. The other children learned from Tomás that Julia was ready to go, and they worked hard Sunday evening making a 'sitting stretcher' for her. One of the children had seen a similar stretcher when an injured man had been carried down from the high mountains. It was a simple wooden chair, tied firmly between two poles. The children finished making it by sunset and the next morning arrived with it at Julia's house. Tomás went with them to give Julia courage. He was so excited that he fell 3 times! Julia was so frightened when she saw the children that she almost decided not to go. But when they brought her special chair to the door, she lifted herself onto it with her strong arms. And before she knew it, she was on her way -to school! The first day of school went well. Everything was so new, and the children were all so friendly, that Julia almost forgot she was afraid. On the way home, she smiled and laughed as the children carried her. Six months have now passed since Julia started school. Although she began 2 months late, she is already able to read and write letters and words as well as most of her classmates. But drawing is what she likes most. The other children often ask her to draw pictures for them. Julia has made many friends. The children in her class who first looked at her as someone 'special', have now accepted her as one of their group. They include her in many games and activities, and treat her as just another child. Some problems have arisen. At first, carrying Julia to and from school each day was fun. But after awhile, many of the children got lazy and stopped helping. This meant more work for those who were left. The children got a new idea and asked their fathers for help. One Sunday a group of about 15 men and 20 children worked on improving the steep path from Julia's house to the main walkway leading to school. They made the curves wider so that the trail would be less steep, removed all rocks, leveled the surface, and pounded the dirt into a hard, smooth surface. One of the children's father had a small repair shop in the village. Another was a carpenter. With the help of their children, these 2 craftsmen made a simple wheelchair out of an old chair, 2 casters, and some bicycle wheels. Julia was excited when she saw the wheelchair. Her arms and hands were already strong, and with a little practice she learned to wheel her new chair up the long winding trail to the village. ''Now you can come and go to school on your own," said Tomás. "How do you feel?" " Free!" laughed Julia. "I feel like writing a declaration of independence!" Then she thought a moment and frowned. ''I know I'm not completely independent- but that's all right. We all depend on each other in some ways. And I guess that's how it should be." " It's being equal that counts," said Tomás. " It's knowing that you're worth just as much as anybody else. Nobody's perfect!" Things also began to go better at home. As Julia's self-respect grew, so did her parents' appreciation of her. Suddenly both Julia and her mother realized that there were many things that Julia could do. She began to help with preparing meals, washing clothes, and taking care of her younger brother and sister. She treated them more lovingly and never pinched or made them cry (except, of course, when they deserved it!). Julia's mother wondered how she had ever managed to get along without Julia's help. She missed her during the long hours she was at school. And when she realized she was going to have another baby, she thought Julia would have to stop going to school to help more at home. Julia's father shook his head. "No," he said. ''School is more important for Julia than for any of our other children-if she is going to learn skills to make something of her life. And besides," he reminded his wife, "if we hadn't sent her to school, she would probably still be sitting outside in the dirt. It took the schoolchildren to teach us what a wonderful little girl we have." Julia's mother smiled and nodded in agreement. "You're absolutely right,'' she said. "The schoolchildren ... and especially that wise little boy, Tomas!" In many communities, a child who is mentally slow, or retarded, has an especially difficult time. Other children may make fun of him for not being as quick as they are, or for not being able to understand, follow, or remember things as easily as they can. They may not realize that this child has the same need for friendship, play, and respect as they do. This activity is designed to help children gain more appreciation of both the needs and possibilities of the child who is mentally slow. They will explore possible ways to help the child to feel a part of their group, and to learn new things at his or her own speed. Do you know a child who doesn't seem to understand or remember things as well as others her age? Does this child play much with other children? How do other children treat this child? How do you think it would feel if you had a similar difficulty? Begin with games and activities that help the children discover what it may feel like to have difficulty understanding, and to be unfairly blamed for that difficulty. Then the children can look for ways to help a person learn that are easier, friendlier, and more effective. 1. Ask one child in the group to 'engleflip'. 2. Say it louder. Get angry. 3. Ask several other children. 4. Now help the children understand what you mean by showing them, assisting them, or gently explaining. How did you feel when you could not understand the teacher? Was it right for the teacher to get angry? Did it help? Did the teacher finally do it better? In what ways? In what ways might your difficulty with 'engleflip' be similar to that of a child who has trouble understanding things? Ask 5 children to put on the role play. They can pretend to be cleaning house. But before they start, ask one child to go out of the room. Tell the other 4 that after they have cleaned for awhile, they should turn to the 5th child and say, "Blah, blah, blah, blah." Tell the 4 children that this means, "Go get some water." But the 5th child will not know this. Tell the 4 children to keep saying the words, and then to add other ways to help the 5th child understand. The 5th child comes back and they begin. Divide the class in groups of 5 (or more) and repeat the game. Have the children think of different situations and different meanings for ''Blah, blah, blah, blah." How did the child feel who did not understand? How did the others feel? What did the others do to help the child understand? The story might begin by one child waking up one morning and not understanding anything anyone says. Each child in the class writes or tells the rest of the story in his and her own way. Invite them to draw pictures with their stories. Ask the children to include in their stories ideas for helping the child understand. This activity could be done in a language or writing class. After they have written the stories, the children can read them to classes of younger children. It is important that the children also realize the importance of remembering things and the difficulties of a child who has an especially hard time remembering. Then they can try to find ways to help that child remember things more easily. Ask the children to do many things, one after the other. Say the list of things in one sentence, very quickly. Do not wait for the children to do each thing before you say the next. If the children cannot remember all the things, repeat the list louder, but just as fast. Now do it differently. Say each thing slowly, and wait until they do one thing before you go on to the next. Place 14 different things on a table where the children can see them. Let them look at them while you count to 30. Then cover them with a cloth and take 7 things away. Remove the cloth. Have the children write down the things that are missing. Repeat the game using 6 different things and removing 3. Which is easier? Ask the children why it was easier the second way. Explain that children who have trouble understanding are often confused when they are given too many instructions at once. Even 2 instructions at once may be too many for such a child. What suggestions do the children have? If the children know a child who has a hard time remembering things, they can help her improve her memory by playing these same kinds of games with her. Start with only 2 or 3 words or things, and as the child's memory begins to get better, gradually add more. Each time the child does well, praise her or give her a prize. STORY AND DISCUSSION: "I FORGOT"
Begin to tell a story about a little boy whose mother asks him to go to the corner store and buy some bananas. He comes back with nothing. Why did he not bring the bananas? Another child could go with the boy- not to buy the bananas, but to help him remember, or give him 'clues'. He could take a picture to remind him-or sticks to remind him of the number. Another child could practice with him at home. Play remembering games. Start with one thing at a time. Praise or reward the boy each time he remembers and does it right. Do not praise and never punish the child when he forgets. Remember: He has difficulty remembering. It is not his fault! How much does the child remember when he gets to the store? Do the children know any child in the village or neighborhood who has difficulty understanding or remembering? feel he has friends who respect him and with whom he can play? learn to do more for himself? go to school, and get the extra help he needs? enjoy himself more and fit into the community better? If there are some children (or grown-ups) in town who make fun of the disabled child or treat him badly, is there anything the children can do? What? What precautions should they take? The story on the next page can give children ideas for helping a child who is mentally slow to learn basic skills. For more ideas, see Chapters 32 to 41. This is the story of 2 brothers, Zaki age 9, and Nasir age 7. Their father was a shopkeeper in Peshawar, and their mother was a teacher. They had a big brother and a big sister who were both students, living away from home. Zaki was doing well at school but Nasir had never even started school. There was something different about Nasir from other children. Nasir was mentally disabled. His brain did not work properly. He could only say a few odd words. He could not dress himself, and he made a mess at mealtimes. Zaki felt ashamed to have such a brother. Neighborhood children made fun of Nasir. They called him nasty names and pushed him about. Nasir would get angry and try to hit them, and then fall flat on his face. Some of the grown-ups would shake their heads and say Nasir had an evil spirit inside him. The worst of it for Zaki was that he had to take care of Nasir a lot of the time, when there was nobody else at home. It meant that he could not go out to play with his friends from school. And there was nothing to enjoy in looking after Nasir. He could not talk. He did not know how to play any games. Zaki felt very sorry for himself, and used to hate Nasir for the times he had to stay in the house looking after him. It was so unfair! He had never done anything wrong, so why should he have to have a brother like that, who stopped him from going out and playing with his friends? One day a visitor came by their house, looking for Zaki's father. It was his cousin, Dr. Daud. Zaki's parents were out. Only Zaki and Nasir were in the house. Dr. Daud noticed that Zaki had been crying. "What's the matter?" he asked. Zaki told Dr. Daud all about his brother Nasir and how his own life was spoiled by having to look after him. Dr. Daud listened carefully. Then he said, 'Yes, you've certainly got a problem. But tell me, what are you doing about it?'' ''What can I do?" cried Zaki. "Nasir's just as bad now as he was 2 years ago, and he'll be twice as stupid in another 2 years time." Dr. Daud looked thoughtful. "Well, he might be," he replied. ''But that depends on how clever you are." "What do you mean?" asked Zaki. "I'm getting good marks at school, while he can't even start.'' "Well," said Dr. Daud, "if you're clever enough for 2 then you could really help Nasir to change for the better. Then you'd both be happier and you'd get more free time to go out and play.'' "How can I do that?'' asked Zaki. Dr. Daud said, "First, I'll have a talk with your father and mother." That evening Dr. Daud called again and had a long talk with Zaki's parents. "I can't give you any medicine for Nasir," he said, ''because there isn't any that will cure him of mental disability. Not even the best surgeons can do anything. But you have the answer right here in your own home. If you have enough time and patience you can teach Nasir to do a lot more than he can do now." But Zaki's father said, "That's just the problem! We don't have enough time at home. I can't have Nasir in the shop. He pulls everything off the shelves. And his mother is teaching at school and then has to get our food, and then gives private lessons. We can't stop working, or we'll never eat and pay the rent." "But Zaki has the time,'' said Dr. Daud. ''He could do a lot to teach Nasir. Why not try it for a month. I'll show you where to start." So Zaki became Nasir's teacher. But he also learned a lot of things himself. He started teaching Nasir to dress himself. Of course, Zaki knew how to put on a shirt. You just pick it up, and put it on! But he soon realized that there was more to it, when teaching Nasir. First you had to find which was the back and which was the front of the shirt. Then you had to find the main hole and get the head through it. Then one arm went into the right sleeve. Then the other arm into the other sleeve. Next you pull the whole thing down over yourself. Then there was teaching Nasir to feed himself. You would think it was obvious, how to eat! But Nasir had to find out step by step how to pick up a piece of chapati, get some curry on it, put it into his mouth and remember to chew and swallow. It took dozens of repetitions and lots of encouragement and rewards before Nasir learned each step. Zaki began to realize what Dr. Daud had meant. He needed to be clever enough for 2 in order to puzzle out how to teach Nasir. But when Nasir succeeded in some small step, they were both so delighted that it made all the effort worthwhile. A few months later Dr. Daud was passing Zaki's house. Zaki came rushing out. "Quick, Doctor, you must come in!'' Dr. Daud hurried in, thinking he would find someone at the point of death. But all he saw was Nasir, grinning broadly in his chair. "What is it? What's the matter?" demanded the doctor. Zaki was so excited he could hardly speak. "He said a whole sentence, Doctor. Nasir did. He's never said more than 2 words together before now. He just said 'Zaki give sweets to Nasir'. I've been trying for months to get him talking. He did it! He did it!" Doctor Daud smiled. "I think you like your brother better than you used to," he said. Some children cannot see or hear as well as other children. Often we do not know about this and the child says nothing. But because the child does not hear the teacher or see the blackboard, he may not learn as quickly as others. So he may try to hide in a corner. We can help him by letting him sit close to the teacher. Also, babies who cannot hear well do not learn to talk or understand as early as others. In this activity, the school children try to find out which young children and babies do not see or hear well, and need help. Do you know anybody who does not see or hear well? Do you act differently with these people? Why? How would you feel if you did not see well? Or hear well? All the children are completely silent for 3 minutes. They listen very carefully to the noises around them. Afterwards, they write down or draw everything they heard. GAME: WHAT DID YOU SAY? One child plugs his ears while another tells a funny story to the group. Then one of the children plays 'teacher' and asks everyone, including the child who had his ears plugged, to answer questions about the story. Finally, they ask him what it felt like, not being able to hear the story well. Have the child sit 'up front' close to the teacher. Everyone can take care to speak slow, clear, and loud (but do not shout). Use gestures or 'sign language' (if the child hears very little or not at all). Watch people's mouths and try to understand what they say. This is not easy if you do not hear the words. Have the children try it. Children who hear very poorly or not at all often cannot speak. This is not because they are stupid, but because they need to be able to hear in order to learn how to speak. This game will help children appreciate the difficulties of a child who cannot speak, and give the children ideas of how to 'talk' without words to a child who does not hear. I'm lost and can't find my house. Was it difficult to explain something without talking? How did you feel when no one understood you? What did the other children do to help you tell them what you wanted to? Could they have done more? What? How might you help children who cannot speak to communicate? Explain to the children about sign language for the deaf. This is like the game in which children 'talk' with their hands. One form of sign language uses mostly the alphabet. Another form, which deaf persons prefer for 'talking' with each other, uses symbols for different actions and things. If there is a deaf child in the school, or in the village or neighborhood, perhaps the children would be interested in finding a way to help that child learn to 'sign'. Or they may want to learn themselves, in order to be able to 'talk' with the deaf child. If 1 or 2 children in the class can learn to sign and then help translate spoken language into sign language, this can allow the deaf children to learn and take part more fully in the school and in the community. (For books to learn sign language, see Page 639-640). Also see Chapter 31. This game can help children understand both the importance of good hearing and the difficulties of not seeing. The children form a circle. One child stands in the middle with her eyes covered. Around her feet are small stones, nuts, or other small objects. The other children, one by one, try to creep up and steal these things. If the child in the middle hears the 'thief', she points to him and he is out of the game. The goal is to see who can steal the most objects without being heard. Put somebody's powerful eyeglasses on a child who needs no glasses. Or, cover his eyes with a piece of tracing paper, wax paper, or other material that you can see through slightly. Have the child try to read from a book with letters of different sizes. Do the same on the blackboard. What trouble does he have? How close does he have to get? Does he read aloud from his book as well as the other children? The children are in pairs. One is blindfolded, the other is her guide. The guide takes the blindfolded person for a walk, letting her feel different things and taking care of her. How did it feel not to be able to see? What did your guide do that was helpful? Not helpful? What might she have done better? Did you trust your guide? One child is blindfolded. He tries to recognize his friends by feeling them. Similar feeling games can be played trying to identify different things by feeling them. Blindfold the children and have them identify things by their smell: things such as orange, tea leaves, banana, and local herbs. After the children play these different games, explain to them that because blind people cannot see, they often develop outstanding ability to identify things through hearing them, feeling them, and smelling them. It is important to find out as early as possible if a child cannot hear or see well. Older children can do some simple tests with their baby brothers and sisters. A class or group of children can also test the seeing and hearing of younger children, such as those in nursery school or the first year of elementary school. Children can notice if their baby sister responds to different sounds, high and low, loud and soft. The baby may show surprise, make some movement, or turn her eyes or head toward the sound. Notice if the baby responds to her mother's voice when the baby does not see her. Or make a rattle from seeds or small stones. Creep up and shake it behind the baby's head, first on one side and then the other. See if the baby is surprised. Then call the baby's name from different places in the room. See if the baby responds. To test if a baby hears some kinds of sound but not others, do this. Sit at arm's length from the baby, and to one side. When she is not looking, make different kinds of sounds. Say "Ps" and "Fth'' to test for high-pitched sounds, then ''Oooo'' for low-pitched sounds. For other high-pitched sounds, crinkle a thin, stiff piece of paper or rub a spoon inside a cup. For other low-pitched sounds, watch if the child notices the noise of a passing truck, a train whistle, a cow's 'moo', or low notes on a musical instrument or drum. An older child stands several meters from a line of younger children. Behind each young child stands an older child with pencil and paper. The first child says the name of an animal VERY LOUDLY. The young children whisper the word to their older partners. The older children write it down. Then the first child names other animals, each in a softer and softer voice, until he is whispering. After about 10 animals have been named, and the words that the younger children heard have been written down, compare the different children's lists. Repeat this 2 or 3 times. Any child who has not heard as many words as the others, or has not heard them correctly, probably has a hearing problem. Let the child sit at the front of the class where he can hear better. Be sure everyone speaks clearly and loudly enough. But do not shout because shouting makes the words less clear. Check often to make sure the child understands. Have one child who hears well sit next to the one who hears poorly-to repeat and explain things if necessary. Always try to look at the child while you are speaking to him. If possible, the child should be examined by a health worker- especially if he has pus in an ear or frequent earache. HOW CAN CHILDREN HELP CARE FOR THEIR BROTHERS' AND SISTERS' EARS? They can regularly look to be sure that there is no pus or small objects inside. If they see anything wrong they should tell an older person, who should take the child to a health worker. Most babies who are 'deaf' hear something. They need help in learning to listen. The children may think of games to help babies listen and learn. Sing to babies, and teach songs to young children. Tell them stories and change voices to sound like different people in the story-loud, soft, angry. Children can notice if the baby begins to look at things held in front of him, to follow them with his eyes, to smile at mother's face, and later to reach for things held out to him. Hang a bright colored object in front of the baby's face and move it from side to side. Does the baby follow with his eyes or head? If not, in a fairly dark room, move a lighted candle or torch (flashlight) in front of the child's face. Repeat 2 or 3 times. 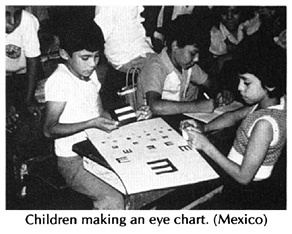 A group of older children can make an eye chart. They can cut out black 'E's of different sizes and paste them on white cardboard. Also make one large 'E' shape out of cardboard or other material. First let the children test each other. Hang the chart in a place where the light is good. Then make a line about 6 meters from the chart. The child to be tested stands behind the line, holding the cut-out 'E'. Another child points at different 'E's', starting from the top. Ask the child being tested to hold the cut-out 'E' so that its 'legs' point the same way as the 'E' on the chart. If the child can easily see the 'E's' on the bottom line, he sees well. If he has trouble seeing the second or third line, he sees poorly. To make the testing more fun, you can use horses in the shape of 'E's. Make 5 cards using different size horses. Make the sizes the same as those shown for the letter 'E' in the chart at the top of this page. Or use a chart with 'C's. Ask the child either to hold a horse shoe in the same position as the different 'C's on the chart, or to tell you for each 'C' which way the horse shoe is going. After the children practice testing each other, they can test the eyesight of those in the younger grades and the children who will be starting school soon. Be sure he sits in front, close to the blackboard. Write large and dark on the blackboard, and check often to make sure he can read what is there. If possible, the child should go to a health worker for more tests. He may need glasses. If he cannot get glasses, try to find a magnifying glass. This may help him read small letters. If the child still has trouble reading, have another child read his books and lessons to him aloud. Are your eyes the same as your classmates? Shiny? Clear? How about the eyes of your younger brothers and sisters? Can you see well in the dark? Or do you often stumble at night? Do a child's eyes look dull? Are there any unusual spots or wrinkles? If so, see a health worker. Many children in different parts of the world become blind because they do not eat foods that make their eyes healthy. Eating yellow fruits or dark green leafy vegetables helps protect the eyes. Some extra cooking oil added to food also helps. If children's eyes are red or sore, you can suggest that they wash them often with clean water with a little salt in it (no saltier than tears). This may help eyes get better and keep the flies away. If they do not get better soon, see a health worker. For more information on eye problems and blindness, see Chapter 30.